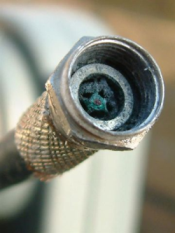 A CLASSIC EXAMPLE OF WATER DAMAGE AT THE COAX END. 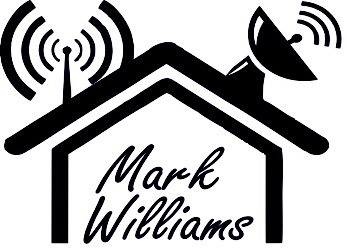 THE CAUSE WAS THE USE OF POOR A AERIAL AND A BAD INSTALLATION AND IT’S SO DISAPPOINTING THAT IT IS A REGULAR THING I SEE FROM LOTS OF OTHER SO CALLED INSTALLERS. 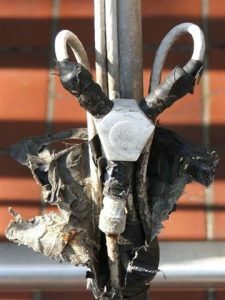 THIS KIND OF DAMAGE CAN CAUSE EXPENSIVE DAMAGE TO CONNECTED APPLIANCES. SO POOR – WHY NOT USE A SPIRIT LEVEL? WOULD HAVE LOOKED SO MUCH BETTER. 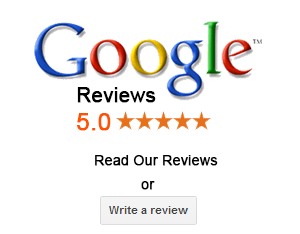 THE SOLUTION WAS TO TAKE DOWN AND RE-INSTALL WITH THE USE OF A SPIRIT LEVEL – LEAVING THE CUSTOMER MUCH HAPPIER. 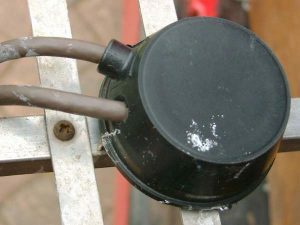 THIS I CAME ACROSS ON BOTTOM OF A MAST ON A ROOF, THE ENGINEER HAD USED A INDOOR SPLITTER AND AS YOU CAN SEE HAD TRIED TO WATER PROOF IT. THESE TYPES OF SPLITTERS ARE NOT DESIGNED TO BE USED OUTDOOR AND CAN CAUSE DAMAGE TO THE CONNECTING APPLIANCE WITH WATER INGRESS. REPLACE THE SPLITTER FOR OUTDOOR TYPE AND REPLACE SOME CABLES BECAUSE OF WATER DAMAGE WAS REQUIRED. THIS ONE I WAS RECENTLY CALLED TO BECAUSE OF THE RECENT WIND AND THE CUSTOMER SAID SHE HAD IT INSTALLED UNDER THREE MONTHS PREVIOUS BY ANOTHER INSTALLER WHO I SHALL NOT NAME. 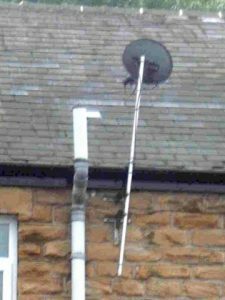 THE INSTALLER DID NOT REPLACE THE MAST OR THE BRACKET JUST PUT THE NEW AERIAL ON THE OLDFITTINGS AND CHARGED THE FULL PRICE. 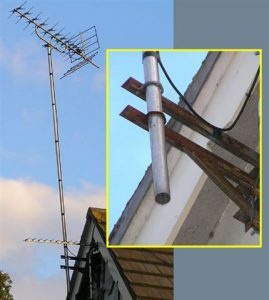 THE SOLUTION WAS TO INSTALL A NEW BRACKET AND POLE, AS THE CUSTOMER COULD NOT GET A RESPONSE FROM THE ORIGINAL INSTALLER. THE ENGINEER RE-USED THE OLD RUSTY CHIMNEY BRACKET AND LASHING WHICH IS INADEQUATE FOR SUCH A LARGE AERIAL AND AS YOU CAN SEE THE BRACKET HAS RUBBED THE CHIMNEY AND DAMAGED IT. THE SOLUTION WAS REPLACE THE BRACKET FOR A LARGE 13″ CRADLE BRACKET AND NEW LASHING. 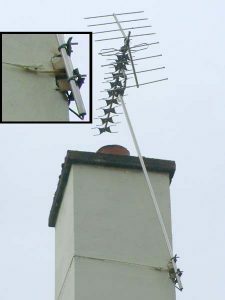 AS YOU CAN SEE THE ENGINEER HAS PUNCTURED A HOLE IN THE CAP OF THE AERIAL TO ACCOMMODATE TWO AERIAL CABLES AND MADE THE AERIAL LIABLE FOR WATER DAMAGE WHICH IN TIME WILL PROBABLY CARRY THROUGH THE CABLE TO THE TV OR CONNECTING UNIT. 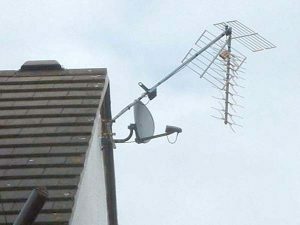 THE SOLUTION WILL BE TO REPLACE THE AERIAL AND ACCOMMODATE THE TWO CABLES WITH A OUTDOOR SPLITTER BOX. THE 24″ T & K BRACKETS INSTALLED ARE NOT SPREAD APART AS TO GIVE SUCH A LARGE POLE STABILITY. SIZE OF THE POLE APART TO GIVE STABILITY TO THE INSTALLATION. THIS INSTALLATION IS VERY POOR AND DANGEROUS AS IT COULD FALL WITH A WIND. THE SOLUTION WAS TO REINSTALL THE BRACKETS CORRECTLY. 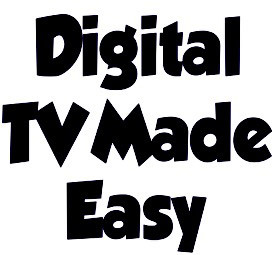 Providing Digital TV aerial, CCTV, wifi and home network set-up services in Swansea, Swansea Valley, Port Talbot, Neath, Neath Valley, Ammanford, Amman Valley and Llanelli.